Anti-fracking campaigners have lost a High Court bid to block further exploration for oil and gas exploration in their West Sussex village. A residents' group from Balcombe claimed the planning permission granted to energy company Cuadrilla to carry out testing was unlawful. Permission for the site at Lower Stumble was granted in May this year. Mr Justice Gilbart ruled West Sussex County Council acted lawfully and told the residents to pay £10,000 costs. Cuadrilla was granted further planning permission on 29 April this year for flow testing at the existing borehole. Flow testing is the monitoring of the speed at which oil comes out of the ground to see how commercially viable it is. At a two-day hearing in London last month the Frack Free Balcombe Residents Association (FFBRA) argued the decision to grant planning permission was flawed by "errors of law". Residents argued planning permission was granted despite massive objection to the development. At the time of the consultation, 889 respondents objected while nine were in favour. Cuadrilla has previously said the testing would last seven days but it was "unlikely" the work would be carried out this year. The energy company has also said it would not carry out hydraulic fracturing at the site because the rock is naturally fractured. 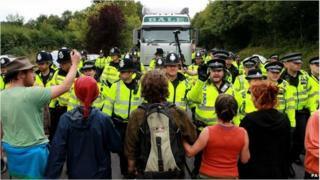 More than 1,000 protesters gathered in Balcombe during exploratory oil drilling in the summer of 2013. Friends of the Earth said residents had been dealt a poor hand in the case. "They suffered a huge amount of disruption last summer with noise from the drilling and extra lorries in their village," said South East spokeswoman Brenda Pollack. "The level of opposition in Balcombe and across the country shows that the public do not have trust in the bodies that are meant to protect us and our environment." FFBRA spokeswoman Sue Taylor expressed fears over what the permission could now mean for local people. "Residents of Balcombe will be exposed to real health risks, as will local water courses and public water supplies," she said. "We wanted to have the existing planning permission rescinded so that these issues could be fully investigated before any further work is done to the well." The county council welcomed the ruling and said it wanted to reassure residents that no fracking had been proposed or approved. "That would require a different application that would have to come before the committee for a decision," it said in a statement. "We were confident that we had been absolutely fair in our approach to a very complex decision and the court has reinforced that."